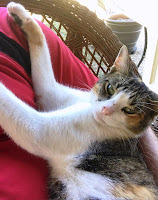 While Josh and Katherine were at a baseball game at the local park, they noticed a friendly calico cat making the rounds and visiting with all the people. After asking around, they learned that the sociable cat was a frequent visitor there and appeared to have no owner. They liked this people-loving cat and decided to give her a home with them. So they took her home and named her Mittens. Mittens settled in very well there in her new home, and was happy to have regular food and loving. Josh and Katherine were very quick to notice and act when Mittens was missing. When they looked for her, they heard her cry from the wooded area next to their property. It took a while to follow her cries until they could locate her up high in a skinny tree inside the woods. Something probably chased her up there during the night. Josh quickly ran out and bought a new 24-foot ladder and placed it under the tree, but it was too short to get close to Mittens. 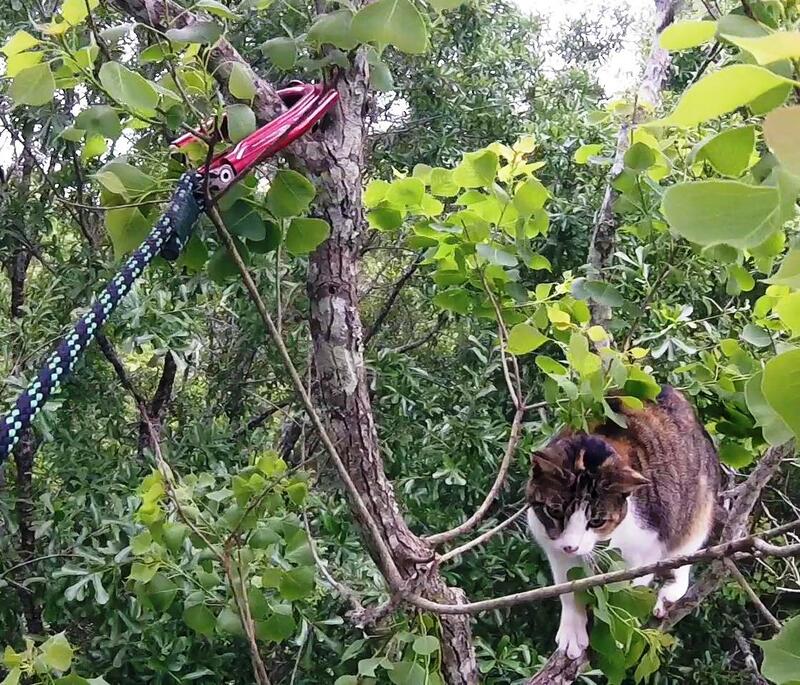 Meanwhile, Katherine was doing some cat-in-tree research on the internet when she found me. 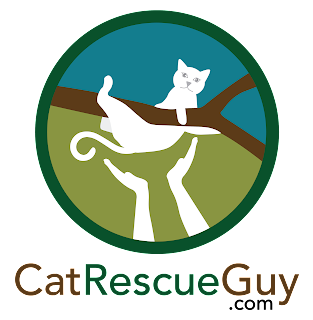 Josh contacted me to ask if I had any suggestions, and I offered to go out there to rescue Mittens. It was a little too late in the day for me to make the drive to Abbeville that day, but I would go there just as soon as I could the next morning. Josh and Katherine led me into the woods and pointed up to Mittens. 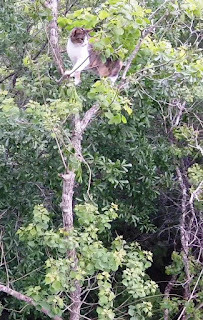 It was difficult at first to see her, but there she was, still perched up there on tiny limbs very near the top of a skinny Tallow tree. To see where she was, I had to step back out of the woods to get a more distant view of her position. That is when I took the picture above. It is painful to imagine how uncomfortable she must have been spending so much time standing on tiny limbs and wanting to rest. We don't know exactly how long she had been there. She probably climbed up sometime during the previous night, so it had certainly been more than 24 hours. I was very disappointed to see that this tree was too skinny for me to climb safely. I could climb about 20 feet, but, after that, it would be too flimsy and would bend and break under my weight. 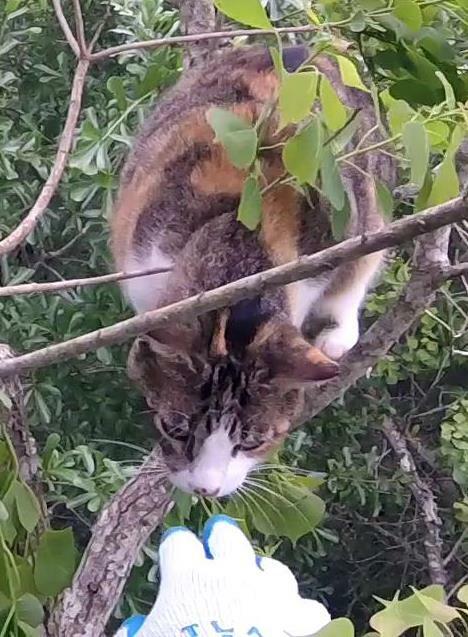 Mittens was about 40 feet high, so I needed another way to reach her. Fortunately, in the woods, there are always other trees nearby, and there happened to be a larger, taller oak just ten feet away. I could climb it, but I would not be able to get any higher than Mittens. Normally, I would want to climb much higher and then swing over to the cat's tree. This time, however, I would not be able to do that, so I needed a different approach. Fortunately, I already knew that Mittens had a friendly and calm disposition, so I was not worried about her reaction to me. 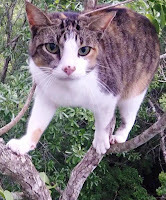 But even while climbing the tree, I was still not sure how I was going to reach her. 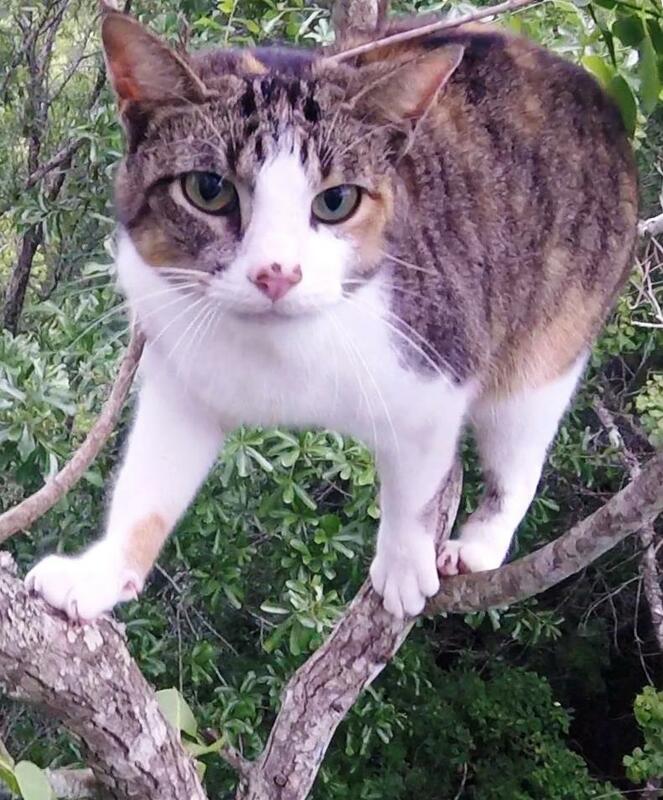 Things always look different in the tree compared to the view from the ground, so I was anxious to see just how far away she would be from me once I got up there. Once I had climbed as high as I could go and secured myself well, I was relieved to see that we were at the same level and that she was only 10 feet away. I could reach her with the rescue pole or net, if needed, but I decided to try another idea that would be safer. I had a climbing hook with me that is normally used to traverse to another tree. I simply throw the hook, with rope attached, into the other tree and hook it over a stout limb. I can then use the rope to pull myself over to the other tree while staying attached to my original climbing rope. In this case, however, I wanted to use the hook to pull the other tree over to me. The tree Mittens was in was too flimsy to climb, but it should be easy to bend over to me, especially at this height. Fortunately, there was a suitable limb above Mittens that I could use for this purpose. 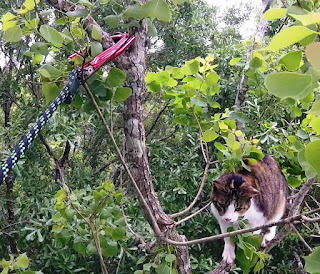 I threw the hook over that limb, and, fortunately, Mittens was not frightened by it. In fact, Mittens stepped up closer to it to get a sniff of this new curious thing. I tightened the rope to the hook and slowly began pulling the tree toward me. As I pulled it closer, I watched the hook to make sure that it would not slide up and off the limb as the angle changed. I also watched Mittens to make sure she was secure and not being frightened by this movement. Mittens was doing just fine, and I was happy that this was working so well. I easily had her within reach and let her sniff my hand. She let me pet her and we were now friends. I had already prepared the gloved bag on one hand, so when the time was right, I picked her up by the scruff and pulled the bag over her. This cat was in the bag, and I heard Josh below let out a relieved, "All right!" I brought her down and handed her over to Josh who took her home and inside. He gave her food and water, and she was soon settled in at home again. Soon she stretched out on one of her favorite beds, and Josh took this picture and sent it to me. A soft cushy bed feels so good when you have been standing for so long on tiny limbs with no place to rest. I hope she remembers that the next time she thinks about climbing a tree.